This “Basics” not only pertains to matching the color to paint a fender on a late model car, but also to know whether that “perfect” color for your street rod you saw on a car at the new car dealership IS actually the color you are buying at the store. The very first step at matching a color is checking to see if there are any “alternate” or “Variant” formulas available for the color. They are called different names by different manufacturers, I will stick to the one I have used the most, “alternates”. These “alternates” happen for a number of reasons. Basically, they are different “batches” of colors used by the manufacturer. This could happen because cars are painted at different plants around the country (or world as some models are made here as well as in Asia or Europe), or even at the same plant when they empty one barrel of paint and start on a new one. The point is, a paint code on the cars information label doesn’t ensure that is actually the color. That paint code could have MANY different alternates! And sometimes they are MILES apart in appearance. There is usually no way to know if there are alternate formulas without looking up the color in the computer or micro fiche (are there still people using micro fiche??). There may or may not be an alternate formula available that matches. Value line paints for instance won’t usually have alternates at all. The color dept of the paint manufacturer is a costly dept, they spend millions of dollars (the big boys do at least) on color formulation. That IS their bread and butter I the collision industry, COLOR. Some companies (DuPont for instance) use a system where you can give them the VIN off the car and the computer will tell them what alternate was used on that car! I haven’t used this system to know how good it works, but pretty interesting. The alternates are usually a much closer representation of the actual color you will get as well. The color examples in a color chip book are usually “ink” and not paint at all! So the colors are “representations” but not “actual” matches. Alternate chips are usually paint and MUCH closer to what the actual paint you buy will look like. Always ask if there are alternate formulas available for the color you are using. If there are a lot of alternates, it is not the paint companies fault. In fact, it only means they care a lot that the color matches and the more they have is more of an indication of how good the company is more than how bad they are. They put a higher importance (read that MONEY) on assuring a good color match with their paint. PPG for instance has a very good color “variant” system, but that is with the high end products like DBC, DBU and Global. But with OMNI (or Shopboy or what ever they are calling it now) their value line, they have none. OMNI and other cheap value lines may be good products and save you some money. But they are not for good color matches, they are for “overall refinishing only”. If they call a color “Guards red” (a popular Porsche red used for years in the rodding circle) that DOESN’T mean it is going to look like the Guards red you will find in DuPonts top of the line ChromaPremere. Or for that fact, there may be a few alternates in the ChromaPremere! If you do paint your car with one of these “off brands” (not a big boy) they are fine for future painting. If you buy a quart of paint from the same people you bought a gallon from a year ago it “should” match the gallon that was sprayed on your car. Just don’t expect a quart bought today to match the paint that is on the car from the factory. So, I have taken a few photos of some alternates to show you just how different they can be. These are pretty old, but you get the point. Some colors may have only one alternate while others will have six, seven or even ten or more! And these are not all the alternates used on the cars at the factory. They are only the ones that the paint company thought were worth their color matching time (read that MONEY) to provide a formula. When I was with Sherwin-Williams the head of the color lab told me that the worse they had was a Ford color with 89 different samples! We are talking 89 different examples of the same make model year and color code!!! And people wonder why colors are hard to match! Of these 89 examples there were so many different examples all over the board of lighter, darker, redder, bluer, muddier, cleaner, etc. than the standard formula that they couldn’t even categorize them! They may have had ten or so alternate formulas with this color, even though there were 89 examples! 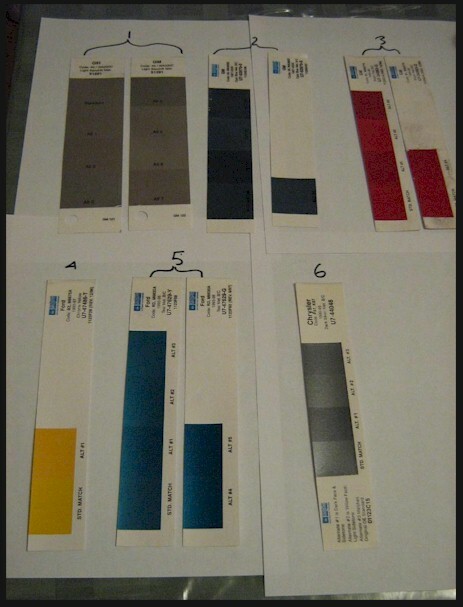 If you are wondering how they get these samples, they were sent in by paint reps usually. We had a sticker we would right all the info on the car in and then stick it to a piece of actual car that was cut off a panel being discarded. This info included make, model, year, VIN, paint code, date of manufacture, location of manufacture, etc. And then the sample would be sent into the color lab in Chicago. In the photo the colors represented in number 1 being GM code 49 light sanddrift metallic (there is a close up photo of that one) #2 being GM code 24 opel blue metallic, #3 GM code 81 bright red, #4 Ford code B2 Chrome Yellow, # 5 is Ford Code RD teal metallic and the last, number 6 is Chrysler code PS7 dark silver metallic. You can see that there are some BIG differences in these colors! The first example on them is the “standard” then alternate #1, #2, etc. 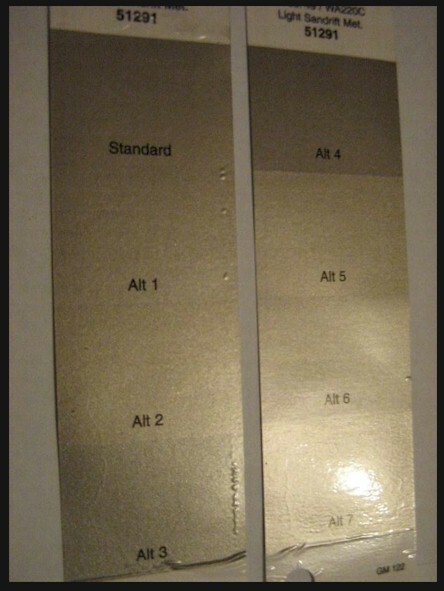 Can you imagine if you had a car painted alt #4 and you go and buy the paint and get the “standard” color? Your new paint is NOT going to match, that is for sure. How about on your Hot rod Duece Roadster, you see your neighbors new Chevy pickup is this awesome Bright red color and the code on the identification sticker in the door jamb says code 81, that’s all you need right? You go and buy a gallon of DBU for about $500 and spray your car. But your neighbors truck is alternate #2 and your paint store mixed you alt #3, your car wouldn’t even look close to that truck! Two lessons here, ALWAYS buy a small amount of the color you want and spray it out to check if it is indeed what you want. ALWAYS ask the guy mixing the paint if there are alternates so you are fully informed. Ask to see the alternate chips, take them out in the sun and take a look at them, be informed as to what you are buying.